November 30, 1929: “The Gumm Sisters” were a part of “Big Brother Ken’s Toyland Revue” at Walker’s Department Store in Los Angeles, California. The sisters had previously been a part of the same show at the same store on November 16 and November 23. November 30, 1931: “Baby Gumm” (Judy) performed for the Knights of Columbus in Lancaster, California. November 30, 1940: This full-page ad appeared in the UK “Picturegoer” magazine. November 30, 1941: These photos (the first two) were published in the Chicago Tribune. These photos aren’t seen much these days even though a shot was used for the October 1941 issue of “Movie LIfe” magazine. 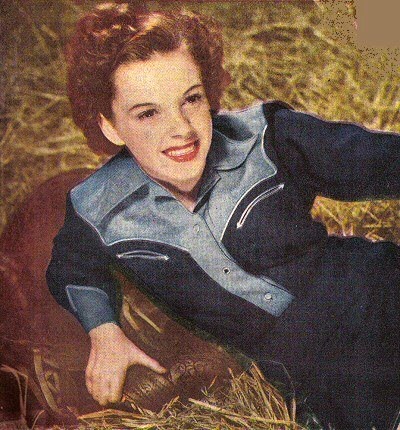 Judy once again posed in the hay in 1945. Women romping in haylofts was a popular theme of photographers in Hollywood and then in the more adult magazines that followed. Thankfully Judy was spared the latter! November 30, 1941: Two Judys. 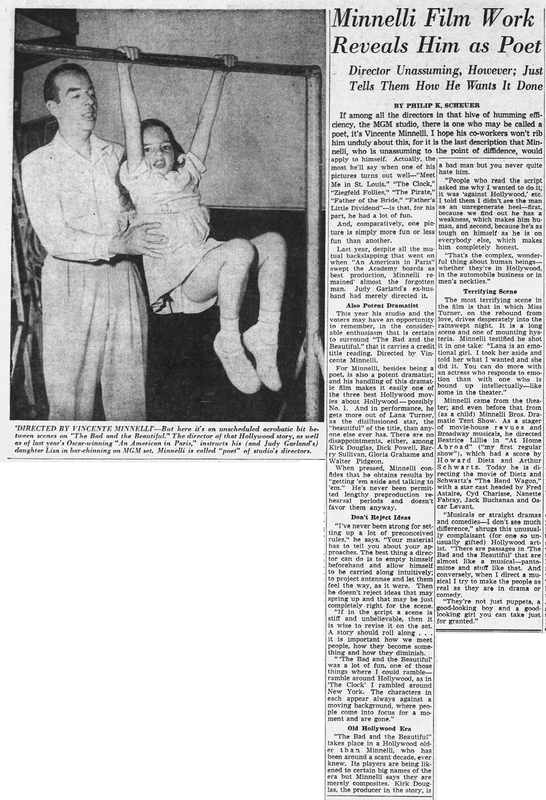 This Associated Press article focusing on Judy growing up made the rounds of papers around the country. Some editions trimmed some of the text. The full text is below. 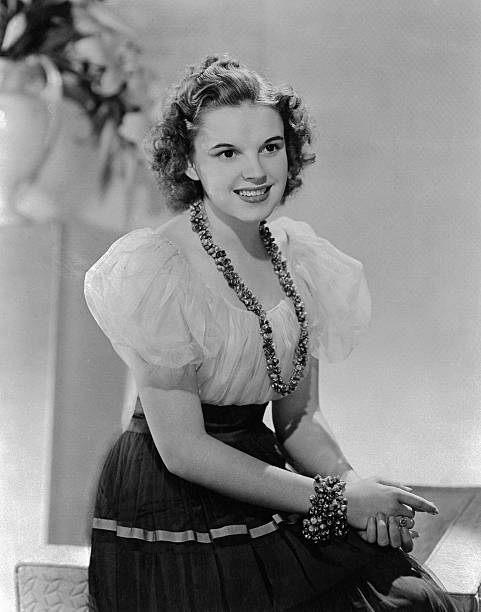 HOLLYWOOD, Nov. 29 – (Associated Press) – – Judy Garland is two persons, sort of, since her marriage. By day, at the studio, she’s still regarded as a demure little actress of high school age, albeit more sophisticated and better developed physically than most high school girls. Both she and her studio say she is only 19. M.G.M., having profited from her juvenile antics in company with those of Mickey Rooney, is slow to relinquish her to adult roles. Executives say they know of no one else who can play Andy Hardy’s sweetheart so satisfactorily. By night, or at any time away from the studio, Judy’s a grown young woman, happy with and proud of the orchestra leader, Dave Rose, she married last summer. 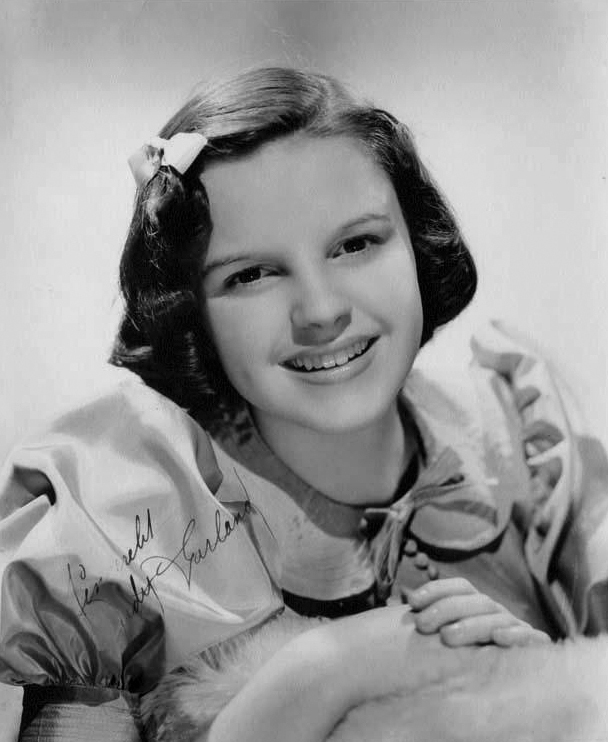 Watch Judy do a scene with Mickey for “Babes on Broadway.” She’s wearing a short dress with puffy sleeves, and she looks like a high school girl. At the moment she’s scorning Mickey’s attentions in what seems to be a puppy lovers’ quarrel. Incongruously, during the rehearsals, she puffs at a cigarette, her wedding diamond blazing as she brings her left had to her mouth. Then call upon Judy in her dressing room. With the day’s work done, she has changed to blue slacks and is putting up her hair for the trip home. She’s not a high school girl now, but an attractive, sophisticated young woman. “I’m letting my hair grow in its natural shade,” she explains, looking into her mirror as she dons a turban-like headpiece. Often, too, you’ll see Judy in nightclubs, an elegant young lady in furs and silk. Always she’s with her husband, and usually Lana Turner and some young man are with them. It’s a far cry from the 14-year-old Judy who was a hit as the homely, freckle-faced, barefoot country girl – a miniature Judy Canova – of “Pigskin Parade” of 1936. Judy’s still a girl, then, by day – but there are indications of a change. The studio is planning more mature roles for her – and Judy says the acting assignments are becoming somewhat more difficult. The scene she refers to calls for her and Mickey to prowl about a dusty, abandoned theater. Suddenly the memory of past performances crowds in upon them, and Mickey appears, in a huge nose and a colorful costume, as Cyrano de Bergerac – as played by Richard Mansfield. 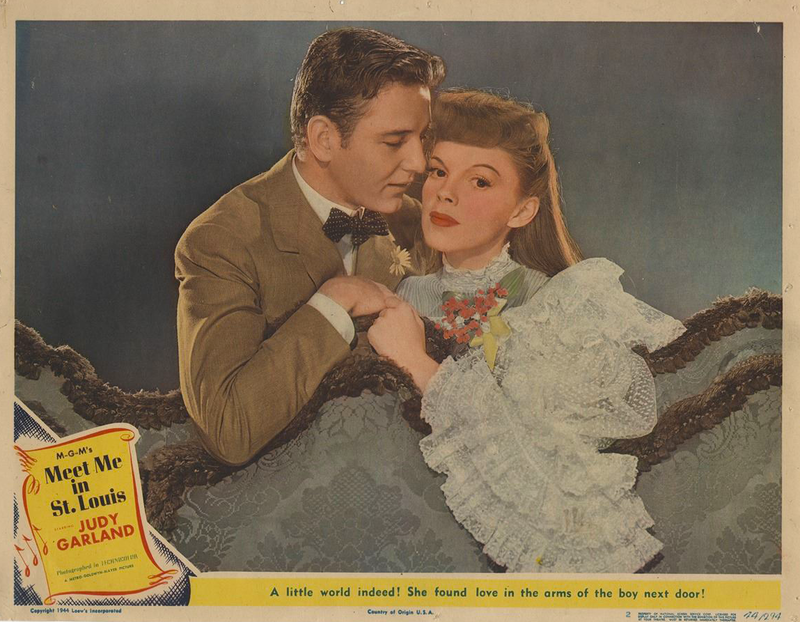 Mickey pops in as Sir Harry Lauder and sings “She Is My Daisy.” Judy returns as Blanche Ring, singing “Rings on My Fingers.” Finally Judy, as Sarah Bernhardt, gives a dramatic reading in French. “I enjoy doing impersonations of people I know,” says Judy. “That’s easy, and fun. But this was something different. “Speaking in French was hard enough. I studied French for four years, in school, but I’ve forgotten most of it. “But to impersonate actresses I had never seen or heard, but who had entertained many people who might see my impersonations – that was the really difficult part. “Luckily, I had Elsie Janis as a coach. She was especially helpful with the Bernhardt role – and with the French. Judy’s employers were pleased, too. They said she impersonated adult actresses so well that she might come to be regarded as an A.A. herself quite soon. November 30, 1942: Judy and Mickey Rooney began production on their next film together, and last in which they co-starred, Girl Crazy. The day was spent in rehearsals from 10 a.m. to 4:45 p.m., which most likely was devoted to the “I Got Rhythm” number as that is what was pre-recorded and filmed first, while Busby Berkeley was still the director of the entire film. He was replaced by Norman Taurog at the end of January 1943. 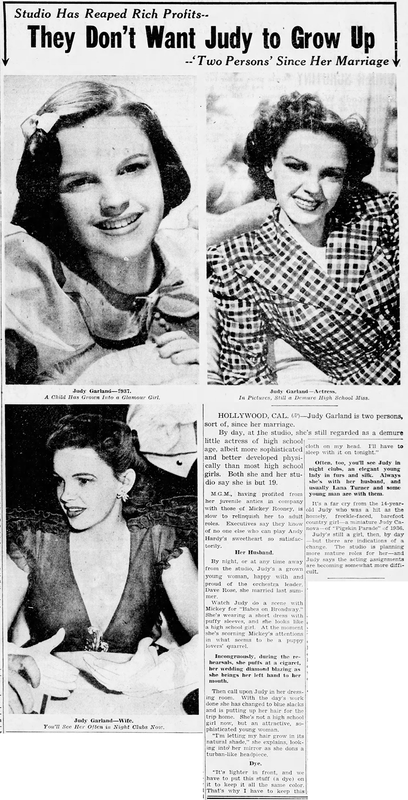 November 30, 1943: Judy had more wardrobe, hair, and makeup tests for Meet Me In St. Louis. Time called: 1 p.m.; Judy arrived at 1:25 p.m.; dismissed: 3:45 p.m.
November 30, 1952: Here’s a nice article about Judy’s ex-husband, Vincente Minnelli. 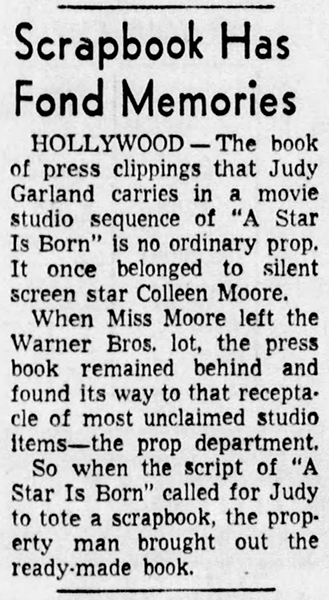 November 30, 1953: This short article claims that the scrapbook Judy, as Esther Blodgett, carries around the “Oliver Niles Studio” in A Star Is Born was one left behind by star Colleen Moore. However, in the finished film, it’s obvious that at least some of the pages are indeed photos of Judy giving rise to the later story that it was actually Judy’s personal scrapbook. Also on this day, Judy has more filming on the “Exterior Night Club Terrace” and “Interior Esther’s Room, Rooming House” sets. Time started: 10 a.m.; finished: 5:20 p.m.
November 30, 1962: Purrs for Gay Purr-ee. from 5:30 p.m. to 7 p.m.) and the taping of the final performance (from 9 p.m. to 10:30p.m.) of “Episode Fourteen” of “The Judy Garland Show.” Judy’s guests were Bobby Darin and Bob Newhart. Judy’s song included: “Football Medley” (cut before the airing; the footage still exists); “Sing, Sing, Sing” with Darin and Newhart; “More”; and a “Train” medley. 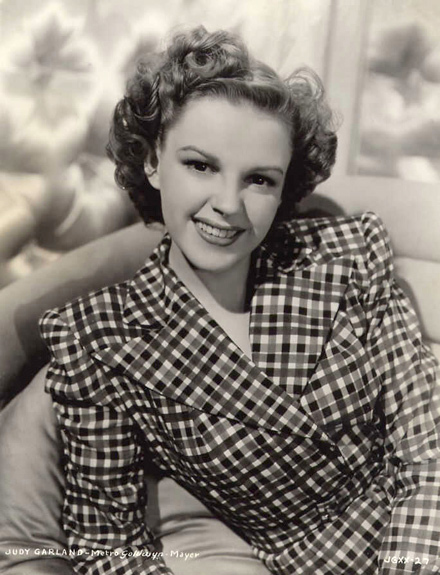 The “Born In A Trunk” segment had Judy singing “Do It Again” and “Get Me To The Church On Time,” followed by the “Maybe I”ll Come Back” closer. Judy also taped a wonderfully funny sketch with Bob Newhart about a couple watching “The Judy Garland Show.” The show aired on December 29, 1963. November 30, 1965: Opening night of a two-week engagement at the Sahara Hotel in Las Vegas. Judy was paid $50,000 per week. Judy and Mark Herron had flown to Vegas two weeks prior and gotten married on November 14th at the Little Church of West at 1:30 a.m. They went back to Los Angeles for Liza’s opening night at the Coconut Grove on November 23rd and were back in Vegas by the 29th. 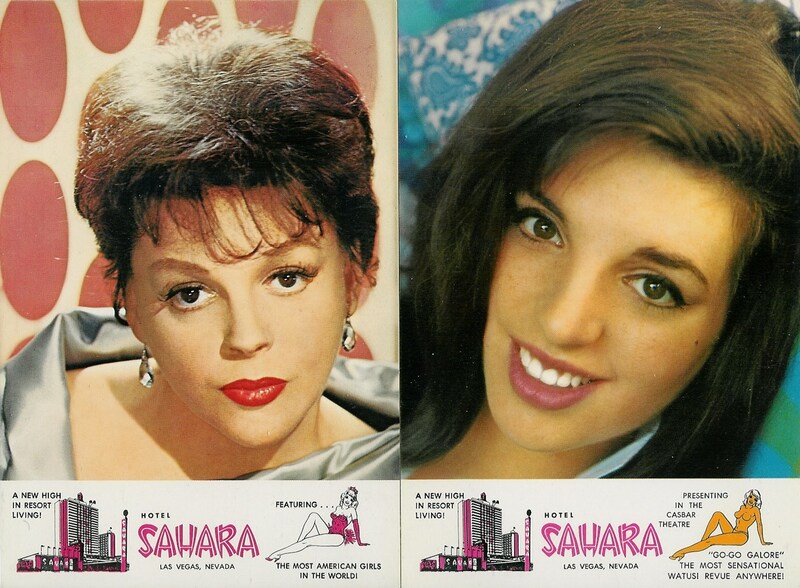 On Friday, December 10th, Judy and Lorna sang “Hello, Lorna!” and “Jamboree Jones.” On closing night, December 13, Judy also sang “Liza” in tribute to the next headliner at the Sahara, who was opening on Christmas Day. It was reported at this time that Judy and Mark would spend the holidays in England and then return to New York in the middle of January for another “Ed Sullivan” show. These two events never occurred. Check out The Judy Room’s “Judy Sings! 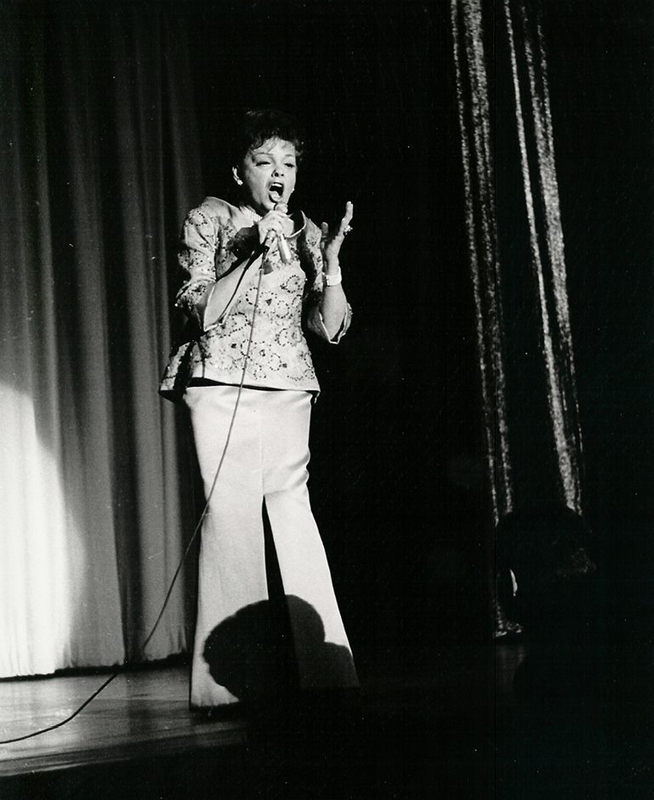 In Concert” page for downloadable Judy in Concert performances. 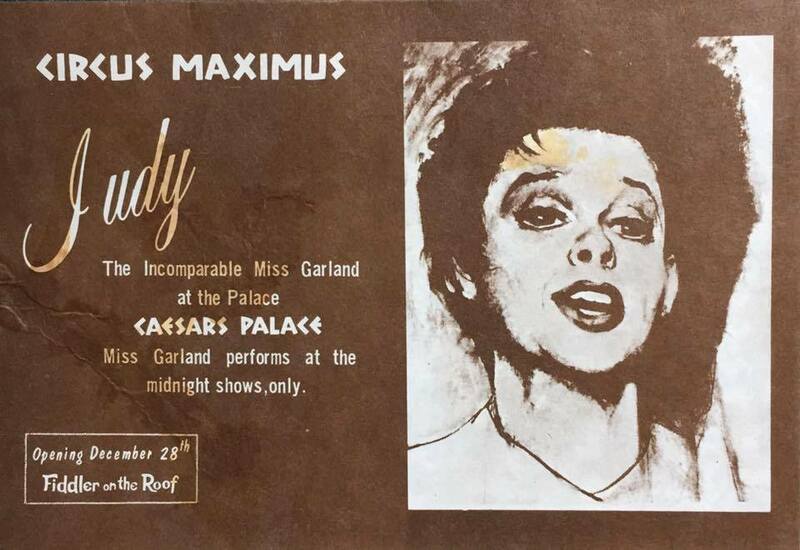 November 30, 1967: Judy returned to Las Vegas for a two-week engagement at Caesars Palace. 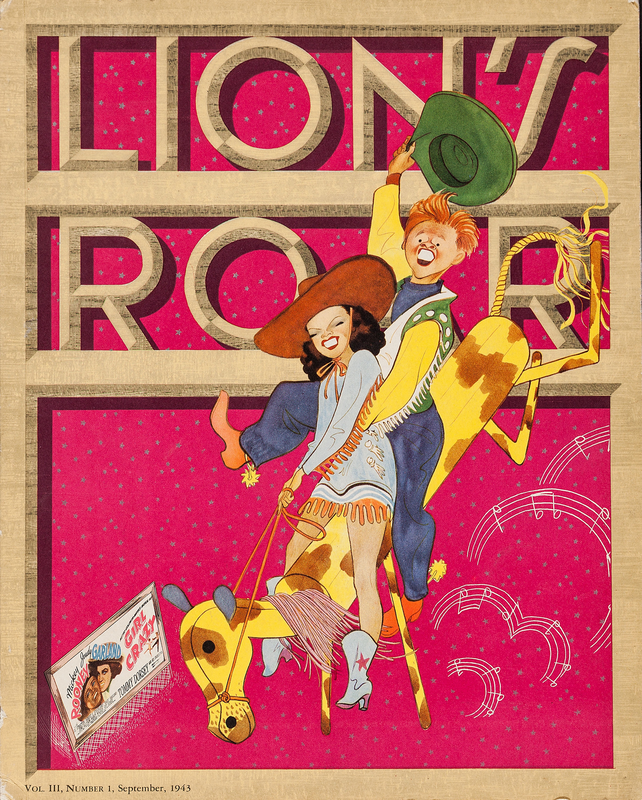 The December 4th performance was canceled due to the death of Bert Lahr. Judy was upset about his passing. 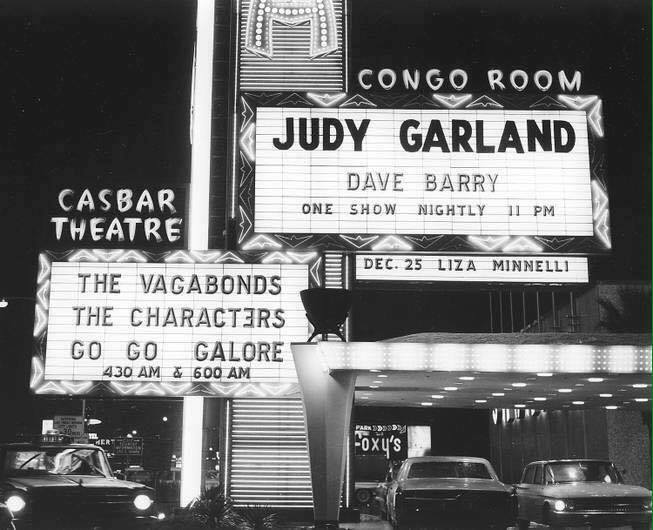 Judy did one show a night only, at a special time: midnight. Judy appeared in the Circus Maximus room and there was often an overflow of 200 or so people who would stay outside of the room to hear her even if they couldn’t see her! 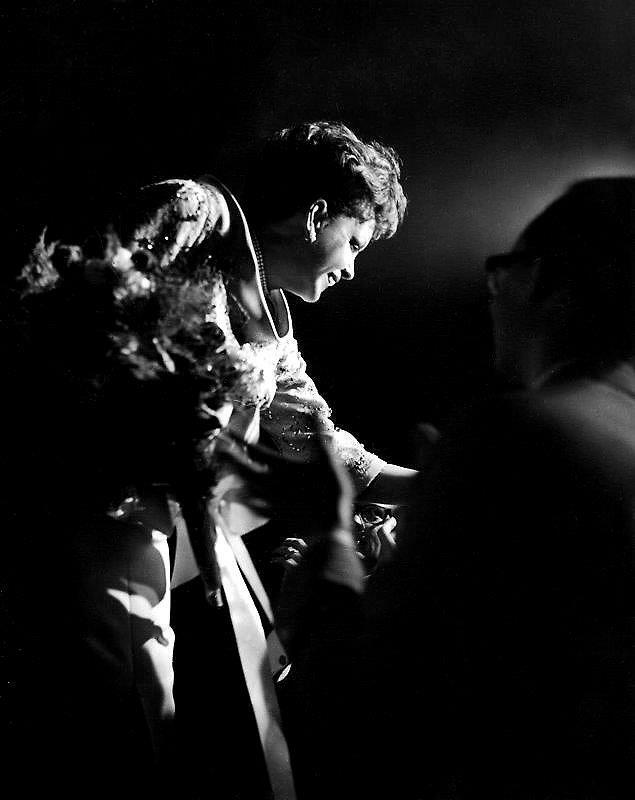 When a squeal came from the sound system, Judy quipped: “And that may be the best note you hear all night!” On one night, Judy was in such form that she gave a two-and-a-half hour show! November 30, 1968: By 5 a.m. on this morning, Judy had apparently lost control in her efforts to call John Meyer at his parent’s apartment (in Boston, Massachusetts). She began banging her head against the wall of her apartment in Cambridge, Massachusetts, so hard that her downstairs neighbor called the police. The police called doctors and by 8 a.m. Judy was in the Peter Bent Brigham Hospital in Boston. At 10 p.m. Meyer called and hospital room (#131) and reconciled with Judy. 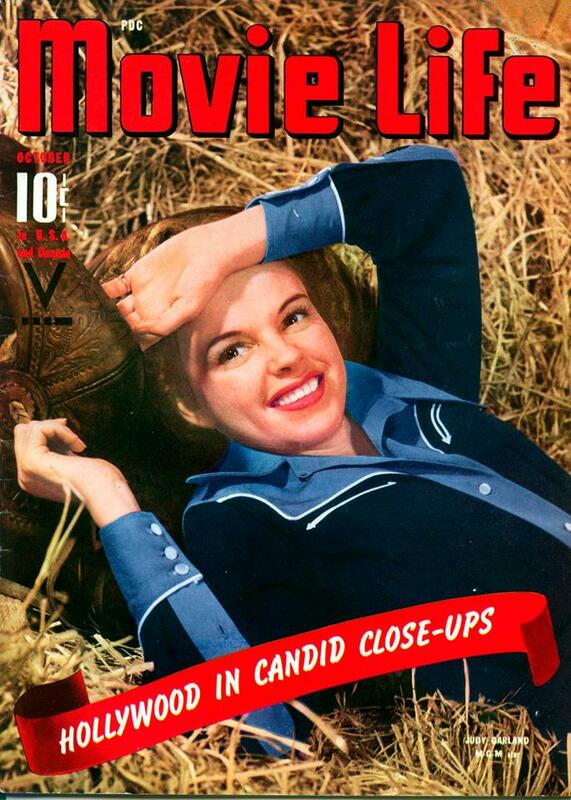 Love those 1941 stills of Judy in the hay. Coincidentally, my very first Garland record (that I paid for with my own money, mowing lawns!) was from Star Tone Records, a fly-by-night. Side 1 was 1940’s radio stuff; side 2 was from her ’60’s TV guest appearances. Here, I was introduced to “Daddy” and “The Right Romance.” Anyway, the cover featured a selection of pics of Judy, the main one showcasing her lying in the hay. A different pose than of the poses you showed, but same photo session. For sentimental reasons, I still own that record!! It’s there, way down. 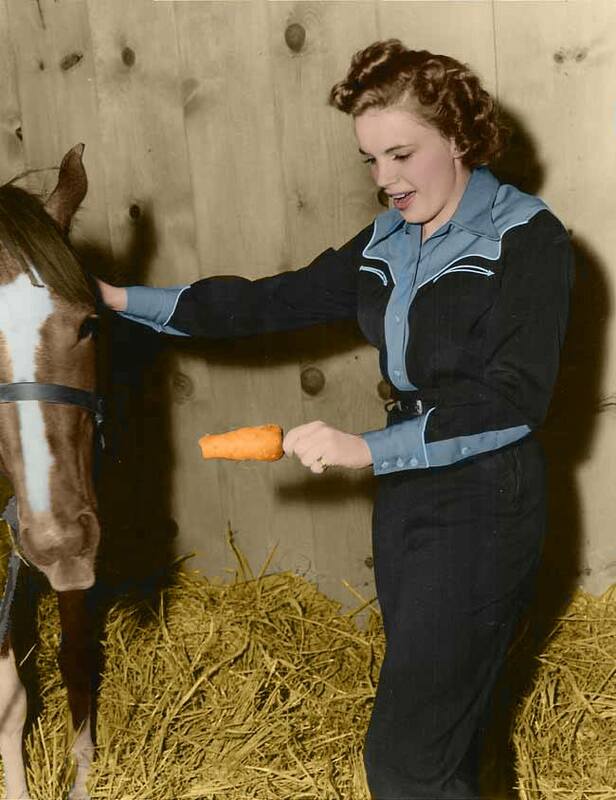 It’s the “Judy Judy Judy!” She’s biting the hay, and one other pic has her holding a camera with a press hat on! Songs like “Speak Low”, “The Right Romance” side one; “What the World Needs Now”, “I’d Like to Hate Myself in the Morning” (a song I LOATHE, btw). I also have “The Wit and Wonder.” Radio stuff, and side two has her (edited) Jack Paar appearances (just talking, but hilarious stuff). I bought mine at Licorice Pizza, which in itself is a time capsule of a record store! All my friends were buying Elton John and David Bowie. NONE of my friends could understand what I heard/saw in Judy. Boy, we are blessed to “get” her magic. Can’t believe we live in an age where we “own” her movies and her TV series!! Unreal. Thanks for taking me down memory lane.